So, in case anyone was wondering, it is possible to eat an entire 3 1/2 pound chicken by yourself in a week. And not get sick of it. While it might mean you occasionally have chicken for 2 out of 3 of your meals, that’s not necessarily a bad thing, especially if you tend to eat lean proteins, good fats, and a variety of veggies anyways. On Monday night, I roasted an organic chicken ($15) following a simpler version of this recipe adapted from Julia Child. For the details, check out that link. But to make it more weeknight friendly, I cooked it a bit more simply, which I’ll explain at the end of this post. I sometimes have a hard time figuring out how to eat everything I cook, since I’m always cooking something, but tend to forget I need to eat it myself within a few days. Here are the yummy meals I got out of the chicken throughout the week, the highlight being this tasty chicken salad! Although I don’t use a microwave at home, I do at work out of necessity – cold soup, cold leftovers don’t really do it for me. Two lunches of raw lacinato kale microwaved with roasted chicken and its pan sauce (a wine & butter sauce with carrots, onions, and celery). Something so simple – just takes two minutes at work – has the ability to transform me from another predictable, boring cubicle-eaten lunch. Just because it’s the workday does not mean lunch can’t be delicious and inspired! At home at night, leftover veggie soup, warmed up with slices of chicken and a drizzle of balsamic for depth. The soup was just leftover broth from another meal, made with sauteed onions and leeks (white part only), about 6 cups of water, carrots, celery root, potatoes, and so on. This was a quick broth- not one that I cooked for a few hours – so the vegetables in the broth still had a great bite to them. Any greens, such as kale or chard, are a great addition here. The same idea as the previous soup, except I added two slices of crispy bacon and a poached egg for a warm, satisfying breakfast. I love soup for breakfast. How to poach an egg – or you could poach the egg directly in the soup, but I haven’t had as much luck with that. A soft-boiled egg would be good here too. I was inspired by a recent post on Smitten Kitchen for egg salad with pickled celery. Since I love love pickled veggies, I was so happy to stumble upon this recipe for quick pickles, and to apply her recipe to the last bit of chicken from the week. In my impatience, or I suppose just reluctance to check the recipe to see exactly how much yogurt and mustard I would need, I added way too much and my chicken salad resembled one of those sad deli sandwiches that when you eat it, you might get the occasional full swallow of mayo. I know you know what I’m talking about, and I’m sorry – ick, really sorry, to bring it up. Really disturbing, but necessary to get my point across. I had no more chicken to add, and it seemed like the dish was past the point of repair. But something had to be done! So, I dug around the fridge to see what else might be welcome to add more texture and reduce the goopiness. This, that, the other thing…threw it all in there, and actually, the end product was way yummier than it would have been had I made it correctly in the first place. Because I clearly didn’t measure how much chicken, yogurt, or mustard I used – and the whole point is to make something with whatever little bits of chicken you have left at this point anyway – you’ll need to experiment. But just start with a tablespoon each of grainy mustard and plain yogurt, adding in veggies until it reaches a yummy consistency. Could be 2:1 veggies to chicken, depending. You could also pickle radishes, carrots, fennel, or a number of other veggies you might already have instead of celery and onions. The celery pickling recipe is from Smitten Kitchen and can be applied to almost anything. Combine vinegar, water, Kosher salt and sugar in a jar and shake it until the salt and sugar dissolve. Add diced celery to jar, cover it and place in the fridge for at least 30 minutes, ideally one hour and up to one week. Quick-pickled onions – same thing! Once the pickles are ready, add a tablespoon or so each of plain yogurt (I used goat’s milk yogurt, yum) and grainy mustard to the chicken. Add in pickled celery and onion, and ground pepper to taste, and any thinly sliced veggies you prefer. I used red and watermelon radishes, which I’ve been in love with lately. A bit more mustard, since I can’t get enough, and some golden raisins for sweetness. No golden raisins? Regular would be fine too, or chopped dates. Carrots would also be yummy. Get creative! 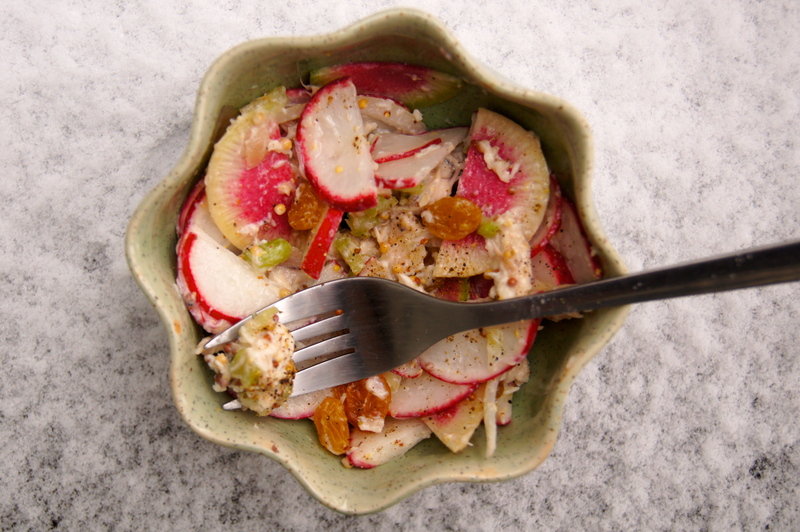 But those radishes…those watermelon radishes! If you got ’em use ’em! It’s SO easy, cheap, delicious and impressive to make homemade mustard. All you need is both brown and yellow mustard seeds, which you can find cheaply at any store that sells bulk spices, and white wine vinegar. I honestly didn’t measure anything the last time I made it, so feel free to Google, but a lot of people just do 1 cup mustard seeds (1/2 cup brown, 1/2 cup yellow) with 3/4 cup vinegar and 1/4 cup water. Cover the mustard seeds with white wine vinegar in a jar and let it sit out, covered, for a few days to a week. The seeds will absorb the vinegar, so you might notice after a few days that there’s less liquid in the jar. If it doesn’t look like there’s enough liquid, maybe add a little more vinegar, but you don’t want it to be too liquidy. It also gets stronger the longer you let it sit. After a few days, it’s ready! No need to blend if you want a whole grain mustard, or blend it briefly for a grainy texture, longer for a smooth mustard. You can also add turmeric, which is in traditional yellow mustard and has loads of cancer fighting properties. Have fun with it! Use the carcass to create a chicken stock along with any root veggies you have laying around the house — don’t use potatoes, since you’ll need to cook it for a few hours and they’ll get mushy. One chicken. So. Many. Uses. Rinse and pat dry the chicken. For 3 1/2 pounds, it should be cooked about an hour. Five or ten minutes more are fine, rule of thumb being about 20 minutes per pound. Salt the bird inside and out, and gently loosen the skin against the breast meat to add salt, thinly sliced garlic, butter and parsley (or most any other herb, such as thyme or rosemary). Chop carrots, celery, and onions (mirepoix). Place some of this inside the cavity of the chicken, with butter, and strew most of it in the earthenware dish around the chicken. Also put some butter and parsley in the cavity. In between the drumsticks on the bottom of the chicken, there’s typically a bit of extra fat. Some of this can be cut off, but I learned in a recent knife skills class that you can put a small slit in the fat pocket on either side, and then put the opposite drumstick through the slit. So, the right leg would go through the slit on the left side, and the left leg would cross over to go through the slit on the right side. Kind of like the chicken is crossing its legs, held in place. Make sense? Then, with a sharp knife, cut off the first half of the wing, where I suppose the “elbow” would be, to leave the chicken with little stubby wings. Put one behind the other in the middle of the back, kind of locking them in place. It will feel like you’re forcing it. Place the chicken breast side up to cook. The wings should be underneath the bird now, allowing the chicken to be level. Doing it this way should give you a nice, even cook with both juicy meat and crispy skin, without the use of twine. Pour a little white wine into the pan if you have it, maybe a bit of water too, or chicken stock if you already have some. I only added wine. Cook at 450F for an hour, basting the chicken with the pan juices every 20 minutes or so. The chicken is done when juices from the thickest part of the thigh run clear when pricked – if not, give it 5-10 more minutes.